11 a.m. – Leading S.C. sword expert and historian Jack Meyer will speak on the “Evolution of the American Military Sword: 1780-1916.” Dr. Meyer will illustrate his talk with examples from his own extensive collection. 12:15 p.m. – More action in the atrium: Ben Battiste will act as swordmaster in a recreation of South Carolina broadsword training circa 1848, with uniformed re-enactors as his students. The session will be conducted exactly as it would have been for a group of antebellum soldiers. 1 p.m. – “Iaido, the Art of Sword-Drawing:” Dan Bernardo of KDA Karate Academy in Columbia will show the Japanese approach to sword usage through the stylized, and lethal, forms of Iaido. Iaido’s aim was to draw and cut in a single motion. 1:15 p.m. – Sifu Saleem of Lam Tung Kung Fu Academy in Lexington will demonstrate a Chinese swordplay form from the Tang Fung version of Hung Ga.
1:30 p.m. – Kids’ Demo: “How To Fight Off Pirates!” The basics of Naval Cutlass explained for youngsters. 2 p.m. – South Carolina competitive fencers will demonstrate the fast-moving modern sport of fencing. 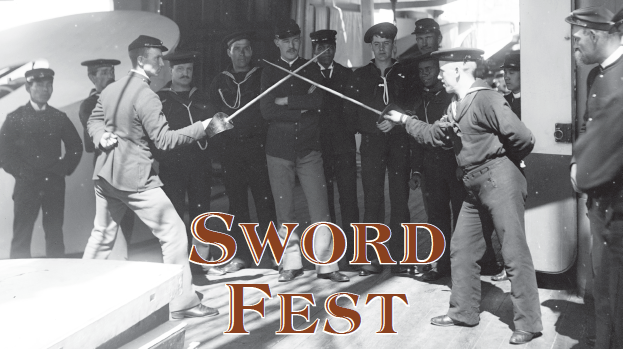 3 p.m. – “South Carolina Sword Stories.” Joe Long, Relic Room curator of education, will relate fascinating tales of swords and swordsmen from South Carolina’s history.